Extreame Savings Item! Free Shipping Included! 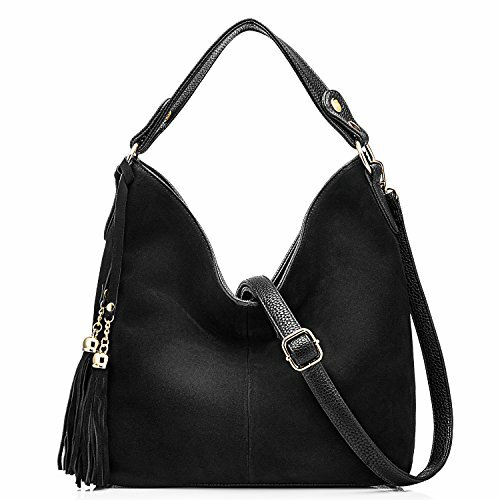 Save 48% on the Realer New Design Women Tote Leather Purse Crossbody Bag by Realer at Purse Outlet Coach. MPN: RHNWB08490100-FBA. Hurry! Limited time offer. Offer valid only while supplies last. This handbag is characterized by it's unique appearance,suede leather & smooth synthetic leather on both side.It is really roomy and practical. This handbag is characterized by it's unique appearance,suede leather & smooth synthetic leather on both side.It is really roomy and practical. Realer- A professional bag seller on Amazon. Having explored various bags for bag lovers,Realer aims at providing bags with high quality and wonderful price.We always try our best to offer good service for all our customers. Main Material: Genuine leather & PU leather. 1.100% brand new and high quality.This handbag takes an unique appearance on the surface.It feels really soft and looks fashionable. 2.You can simply carry it as a casual handbag or a crossbody bag. It is not just comfortable to wear but will also certainly gain lots of positive complements. 3.Roomy compartment provides ample storage with quick and easy access for all of your small essentials. It is able to hold some daily stuff,makeups,cell phone, wallet and other personal belongings. 1. When not use for a long term, please tightly wrap it into the bag and keep in cool and dry place. 2. It may have natural odor at first,but the smell will disappear after a couple day airing out. ♫ QUALITY QUARANTEED - We know you'll love our wallet as much as we do, If it does not meet your expectations, please contact us freely, we will give you a best solution.SHOULDER BAG SIZE - 11" x 9.8" x 4.3"(WxHxD) strap height:6.7"